PIZZA Express is using halal chicken in every meal that contains the meat – but customers only find out if they ask. The chain decided to only serve chicken that is killed in line with strict Islamic law after feedback from Muslim customers. But diners are not warned in advance the chicken they will be eating is halal. There is no mention of it on menus and staff only tell customers if they ask. Islam says chicken can only be eaten if the bird’s throat has been slit while it is still alive. A verse from the Koran is also recited. Some non-Muslims object to halal because they claim the ritual killing can cause unnecessary suffering. 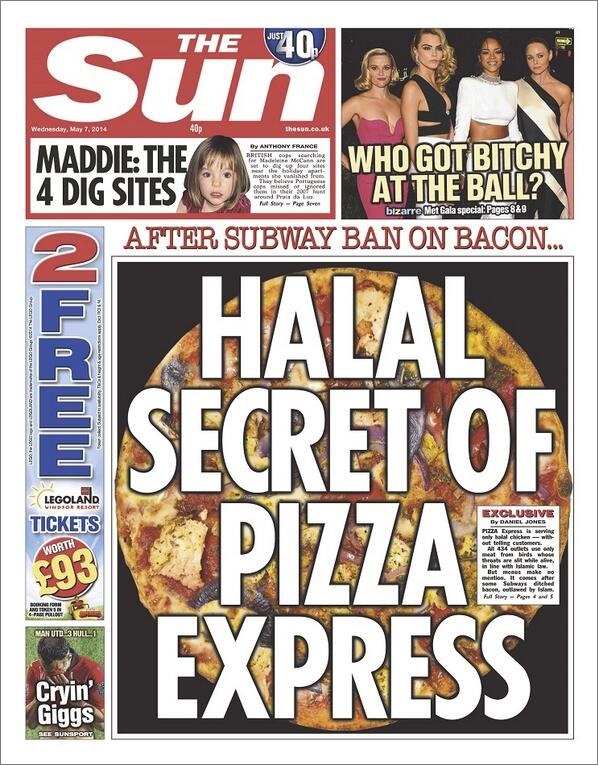 It comes after some Subways ditched bacon, outlawed by Islam. At Pizza Express’s 434 outlets popular meals such as Pollo ad Astra pizza, Pollo Pesto and the salads Chicken Caesar and Pollo Pancetta are all made with halal chicken. The Sun last week revealed sandwich chain Subway had banned ham and bacon from 185 of its 1,500 UK outlets. Muslims are forbidden to eat pork products. These outlets now offer only halal meat. The RSPCA said: “We recognise religious practices should be respected but we also believe animals should be slaughtered in the most humane way possible.” Saqib Mohammed, chief executive of the Halal Food Authority, said the Islamic method of slaughter is not cruel if performed correctly. Pizza Express helped parent firm Gondola Group turn over £604million last year – up four per cent on the previous year. Gondola also owns the Zizzi restaurant chain, which does not serve halal meat. Pizza Express sources its halal chicken from a supplier accredited by the British Retail Consortium, but it refused to name them.